As his horde of Mercenaries grows, Captain Vladimir Nikinov, or the 'Black Wolf' as he is infamously known, has now complemented his deadly naval forces with a devastating Aerial Battle Group. At the heart of this new force is the massive and most intimidating Retribution Sky Fortress, one of the most impressive flying models in the world of Dystopian Wars. The Retribution is designed to act as a mobile command center for Nikinov should be choose to leave his famed Death Bringer Submarine, and as such the Retribution hammers enemy models with withering fore weapons, brutal rocket batteries and crushing bomb attacks. In support of this beast are three Chimera medium airships, also armed with fore guns and rocket batteries, and supporting these are five small Wrath airships, armed with fore and aft turrets. 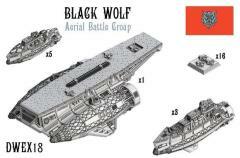 The arrival of aerial mobility to Black Wolf forces makes them an even more dangerous foe to fight off, both as a standalone force or as mercenaries hired by the various nations of the Dystopian World. Only one fleet is spurned by Nikinov, that of the Russian Coalition, the Admirals of which have orders to kill the Black Wolf on sight.